Our courses are approved with the Oregon Building Codes Division to meet your continuing education needs. Take the continuing education to renew your OR Plumber's license today. All of our courses can be completed At Your Pace Online to help you meet the state's requirements to maintain your license. Once you finish your class you will have an official certificate of completion to save for your records, and we will report your course completion to the state for you. The 8-hour class discusses a wide range of key plumbing Codes and provisions from the 2017 Oregon Plumbing Specialty Code (OPSC), arranged by topic to help appreciate how the codes work together. 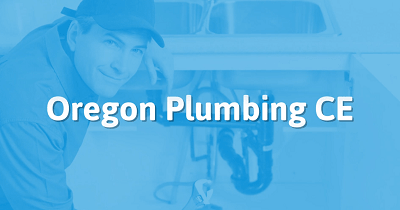 This course provides a well-rounded approach to the most recently adopted plumbing code for Oregon, the 2017 OPSC to help journeyman plumbers in the state refresh and deepen their knowledge of the codes. The 4-hour class presents every significant amendment to the 2017 OPSC adopted during the code review process for the 2017 Oregon Plumbing Specialty Code (OPSC) along with a review of licensing, state rulings and appeals, and the interaction of all the rules and regulations that govern plumbing in Oregon. This course meets the Rule & Law requirements for journeyman plumbers. It provides a thorough-going presentation in the rules and laws that have changed for the 2017 OPSC and the reasons for the changes, with a special focus on the amendments to the 2017 OPSC as presented the "Matrix" published by the Plumbing Board's Code Review Committee. The course also covers permit process and requirements. alternate method rulings, and the location of plumbing requirements, interpretations, and enforcement actions. The 4-hour code-related class provides a thorough grounding in the principles of Rainwater Harvesting and its specific application in Oregon. This course provides both a basic understanding of Rainwater Catchment Systems and the specific conditions, rules, codes, and resources available for Rainwater Harvesting in Oregon. The 4-hour class presents every significant change from the 2014 to the 2017 OPSC based on changes to the 2015 model Uniform Plumbing Code. This course meets the minimum code-change requirements for journeyman plumbers. It provides a thorough grounding in what codes have changed for the 2017 OPSC (based on changes to the 2015 UPC), with some references to Oregon amendments to the codes. The 4-hour code-related safety training class provides a practical guide to safety on a plumbing job site, including how to avoid injury, strain, toxic exposure, and electrical and other hazards. This course provides a systematic and down-to-earth guide on the hazards that may be present on a plumbing job site and the best ways to reduce the chance of injury or illness, the rules adopted by Oregon OSHA for plumbing and construction job sites, and first aid that can be applied when an injury occurs. The State Plumbing Board, through the Building Codes Division, received the following application for plumbing continuing education credit under Oregon Administrative Rules 918035-0000 to 918-035-0080. On January 18, 2017, the Board's Continuing Education subcommittee reviewed this application and recommended approving this course. The State Plumbing Board, at the board's February 16, 2017 meeting, considered and concurred with their recommendation to approve this course. If you have any questions related to the approved course please contact Becky Rasca, CE Specialist, at 503-378-4867. If you have any questions regarding the board's actions, feel free to contact me.